BMW had a story to tell at CES this year, a story of what our lives might look like when there’s more continuity between what we do at home and what we do in our cars, thanks to new features coming to market, including connectivity and self-driving capabilities. I became a part of that story as I drove a prototype 5 series (fun even in manual mode) onto a public Las Vegas highway, pressed a button on a steering wheel and let the car’s test Co-Pilot system take control so I could focus on other tasks. Like filming the HUD on the windshield two-handed using our cameraman Clint’s Canon C100 from the driver’s seat; folding my arms behind my head and closing my eyes to relax and enjoy the ride; or turning completely around in the driver’s seat to face BMW’s Jay Patel and have a conversation about the various things I can do in the car thanks to his company’s Open Mobility Cloud now that I don’t have to pay attention to the road. To back up a bit, before I ever got behind the wheel BMW took me through a demo of what the start of a day might look like once drivers and partners are using its Open Mobility Cloud throughout their lives. A prototype “smart window,” which is not intended to represent a product BMW intends to ship, but just a possible interface for the kind of driver data it wants to keep track of across its customer’s lives, let me arrange a schedule and set tasks. One example was to take a movie a child in the family was watching on Amazon and throw it to your car, letting them later pick it up where they left off at home. It basically seemed to function like our phones do now, letting us pick up digital activities on the go, but this time through the in-car interface. While on the ride, for instance, activating the demo kid’s movie also automatically retracted a rear window shade and closed the sun roof, optimizing the rear seat viewing environment. Meanwhile I got a route to my appointment for the day from my calendar in the vehicle, with navigation automatically picking up the baton. A reminder that I needed to get a gift prompted another in-car activity, letting me order some last-minute presents on Amazon, which we actually collected on the ride at an Amazon Now pick-up point. I had time to mess around with all this stuff because once we entered the highway, I didn’t have to worry about the road at all. This wasn’t a cruise assist demo where you have to maintain attention; Patel encouraged me to turn away from the windshield, relax and enjoy the mountain view. A safety driver in the passenger seat was nonetheless present in case anything went wrong, with a one-handed manual control able to speed us up or slow us down. We were also following a BMW lead car, meant to simulate a convoy between a “Mom” and “Dad” en route to a party at “grandma’s house,” but it’s just as likely the lead car was there to block for the self-driving vehicle, and provide a reference point for it to easily track, too. Patel noted that I was one of the most comfortable people who’d done the demo (and we were among the last), and in truth I did trust the car pretty completely, pretty quickly. I did take in the scenery, did some filming as mentioned, gave a lot of two-handed thumbs-ups and pretty much otherwise thrilled at giving up the wheel. The one thing I couldn’t do was use my smartphone to shoot a POV video — because being at the wheel while on a cellphone is illegal in Nevada. Both the trip out and the trip back went smoothly, both while I was in control on city streets and while the car was driving on the open highway across a few miles. 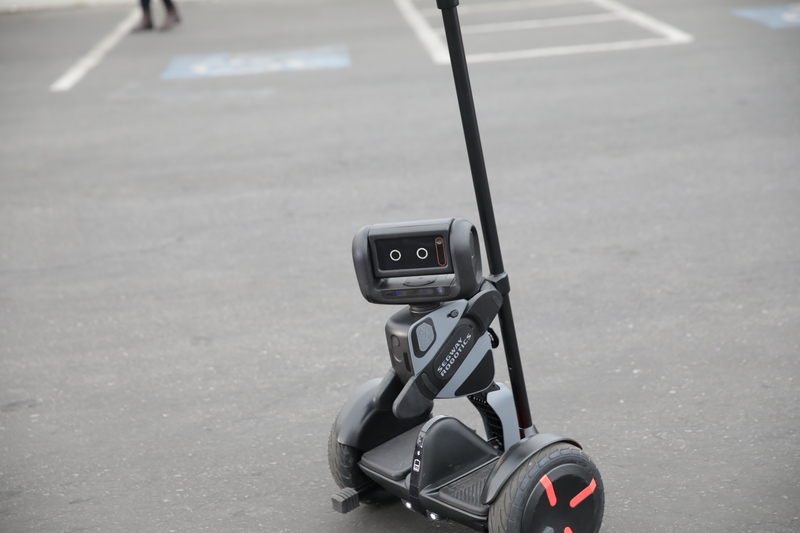 Then, once we returned, a Segway robot equipped with Intel tech greeted us, directed me to enter a pre-parking zone and bade me exit the vehicle as the autonomous parking system ended the trip, reversing the 5 series neatly into its spot.